China has bet the security of its billion citizens largely around one weapon system: missiles. Which is why planned U.S. advancements to Washington’s mobile missile shield is freaking Beijing out. Its military chiefs figure they need to upgrade their own cache of various missiles or risk losing the ability to deter the U.S. Navy and Air Force. Not exactly the response American military planners had in mind. The PLA “will have to modernize its nuclear arsenal” because American missile interceptors “may reduce the credibility of its nuclear deterrence,” Maj. Gen. Zhu Chenghu of China’s National Defense University told a panel in Beijing on Wednesday. Chenghu elaborated to a Reuters reporter that the U.S.
interceptor system “undermines the strategic stability.” He was referring to the United States’ planned anti-ballistic missile system, which is slim at the moment, but by 2020 is supposed to shield Europe from short, mid-range and eventually intercontinental missile attacks. While the shield is intended to defend Europe against an attack from Iran, the interceptors are both land- and ship-based — meaning the system can be packed up and moved. If, say, North Korea starts tossing missiles around, the United States could send ships to shoot them down. Those same ships, Chenghu’s thinking goes, could be used against China. China depends on missiles more than you might think. While China is modernizing its military by boosting its defense budget, retrofitting a Russian aircraft carrier, and building new submarines and destroyers, its security in the near term depends on its massive stockpile of missiles. The U.S. believes China possesses 130 to 195 missiles capable of being armed with nuclear warheads, according to Reuters. To fill gaps in its conventional military, China has boosted its missile arsenal up to nearly 2,000 non-nuclear ballistic and cruise missiles. It could potentially lob around a thousand of them as an initial strike weapon against Taiwan or U.S. bases in the Pacific. But that over-reliance on missiles has left China with a glaring vulnerability. That’s where the U.S. missile shield comes into play. Today, the main bulwark of the U.S missile shield is in the early stages of implementation, in Eastern Europe and the Middle East. There’s a radar station in Turkey and the destroyer U.S.S Monterrey — armed with SM-3 interceptors — in the Mediterranean. NATO plans to put in ground-based missile interceptor sites in Romania in 2015, and press ahead with more interceptors in Poland by 2018. More stressful from China’s perspective: Alaska and California also both have SM-3 sites. And the Pentagon is getting better at downing ballistic missiles. There’s no guarantee the untested system will work in combat. But in case there’s any doubt about the United States’ role in the Pacific over the coming years, the U.S. Navy will emphasize “air-to-air, electronic attack, electronic warfare, anti-submarine, and our capabilities in anti-ship ballistic missile and anti-ship cruise missile defeat,” Adm. Jonathan Greenert told reporters late last month. That poses a serious risk to China. 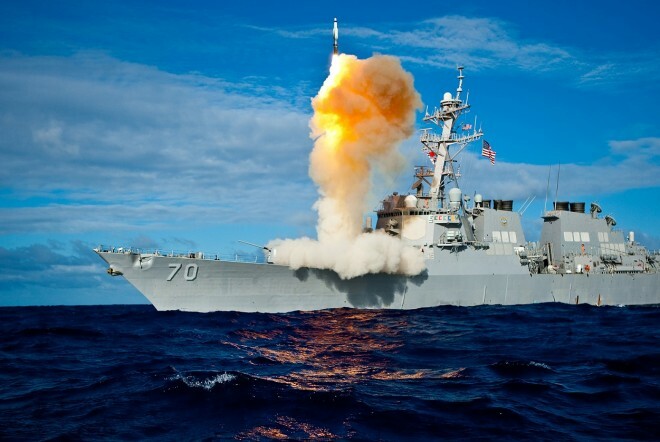 By investing so much in ballistic missiles, the United States responds by upgrading its missile defense system. In response, China has to build even more missiles, in the hope of getting past the system. And it’s not just building more missiles, it’s building more capable ones, too, like the DF-21D, which is supposed to be able to kill an aircraft carrier. That’s where the logic of over-relying on missiles takes you. But there’s an irony in here for the United States, too. Its new animating concept for the Navy and the Air Force is to be able to stop any adversary from pushing ships, subs, jets and bombers away from its shores or its skies. The number-one way most adversaries do that: missiles. If China reads the revamped U.S. missile shield as a provocation that requires a new wave of missile advancement, that’s going to make the Navy and Air Force’s job more complicated. (Complicated isn’t the same as impossible, though.) China may not be the only nation locked into faulty defense logic.